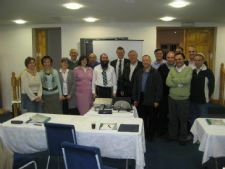 This week marks the beginning of a new series of JLI – the Rohr Jewish Learning Institute – classes in London and Leeds. The new course, entitled “Biblical Reflections: Find Yourself in the Stories of the Bible,” takes participants through the book of Genesis exploring the way in which the biblical narrative and characters capture the imagination and provide a window into the soul. The six-session course, professionally designed for people at all levels of Jewish knowledge, began this week in London taught by Rabbi Dovid Katz, education director of Hendon Chabad House. “In March we had a successful JLI course which explored Jewish civil law,” says Rabbi Katz. In Leeds, the course begins on Tuesday 19 March led by Rabbi Eli Pink, director of education at the Lubavitch Centre of Leeds. Leeds will also be the first city outside the United States to run a JLI course adapted especially for teenagers. The classes will use CCTV footage and movie clips to trigger discussion on Jewish topics such as extreme sports, drug abuse, suicide and saving lives. "I am really proud that we have been given this opportunity," said Rabbi Reuven Cohen, Lubavitch Youth director. "It is an exceptional course and teenagers will benefit." The Rohr JLI is the is the largest institute of adult learning of its kind and participants in London and Leeds will join with Jews from around the world in over 300 cities where the JLI course is also taking place.